Sea level rise is one of the manifestations of climate change and may cause a threat to the coastal regions. Estimates from global circulation models (GCMs) are either not available on coastal locations due to their coarse spatial resolution or not reliable since the mismatch between (interpolated) GCM estimates at coastal locations and actual observation over historical period is significantly different. 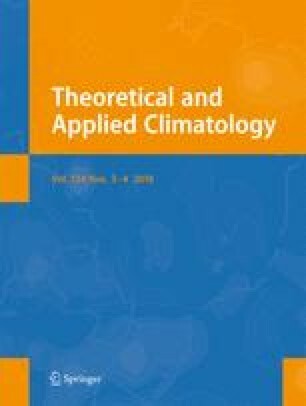 We propose a semi-empirical framework to model the local sea level rise (SLR) using the possibly existing relationship between local SLR and regional atmospheric/oceanic variables. Selection of set of input variables mostly based on the literature bears the signature of both atmospheric and oceanic variables that possibly have an effect on SLR. The proposed approach offers a method to extract the combined information hidden in the regional fields of atmospheric/oceanic variables for a specific target coastal location. Generality of the approach ensures the inclusion of more variables in the set of inputs depending on the geographical location of any coastal station. For demonstration, 14 coastal locations along the Indian coast and islands are considered and a set of regional atmospheric and oceanic variables are considered. After development and validation of the model at each coastal location with the historical data, the model is further used for future projection of local SLR up to the year 2100 for three different future emission scenarios represented by representative concentration pathways (RCPs)—RCP2.6, RCP4.5, and RCP8.5. The maximum projected SLR is found to vary from 260.65 to 393.16 mm (RCP8.5) by the end of 2100 among the locations considered. Outcome of the proposed approach is expected to be useful in regional coastal management and in developing mitigation strategies in a changing climate. subjected to the condition that U T U = 1. The above function is the optimization problem which gives the orthogonal transformation matrix U. If we consider the symmetric and real matrix Q = XHLHX T , the eigenvalues of this matrix Q are λ 1 ≤ λ 2 ≤ . ……λ p and corresponding eigenvectors are v 1. . ……v p . The solution of the optimization solution is given by U=[v p , v p − 1, ……, v p − d − 1]. Here, d denotes the dimension of the space S. The target variable is only one that is the sea level; hence, d is one in this study.